The rough grating provides unmatched traction and a place for dirt and debris drop from your shoes. The boards install easily and look great on the majority of trucks available now. Dee Zee Rough Step running boards are built with industrial strength for serious truck owners in mind. If you need truck running boards that are tougher than tough and made to withstand any sort of terrain or rough conditions, then these are a perfect match. Their rugged construction assures they can take some serious punishment, and their NRT (No Rust Technology) treatment from Dee Zee means they'll stay looking great through it all too. 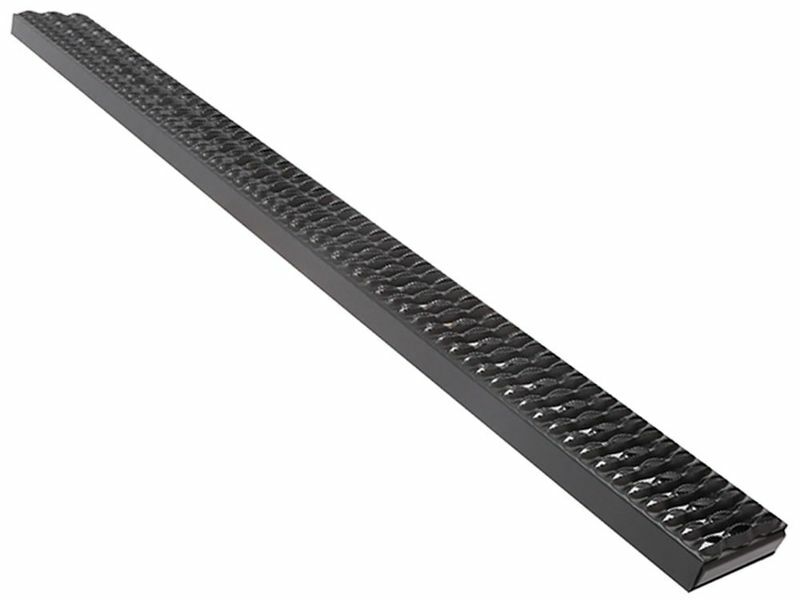 Dee Zee Rough Step running boards feature a grated aluminum stepping surface that offers plenty of grip for your feet. They also are made to drain off rain, dirt, and other debris, so you'll always have a clear area to step down onto. This can be extremely handy during inclement weather and offers extra safety over other running boards. Available in corrosion resistant black powder-coat finish, Dee Zee Rough Step running boards are made with rugged appealing appearances. They are also easy to install onto your pickup, requiring no drilling so you won't have to put extra holes in your vehicle. Made in the USA and backed by a limited lifetime warranty, once you have them on, they'll continue to look and work great for years to come. These are the heavyweight prizefighters of the truck running board world, and will add a great amount of extra safety and stability to the accessibility of your prized pickup. Order a pair today and step up to an all new level of heavy duty comfort and convenience.